Welcome to the Our Lady of Perpetual Downforce blog. Here we will be detailing the preparation of our entry for the 24 Hours of Lemons. We're competing in the April 4-5th 2009 race in South Carolina. We've made lots of plans, but with only 3 months before the race we're starting the excecution. I've never been a fan of professional racing. Watching cars going around a track fast just isn't that interesting to me. I think driving is fun, as my traffic citation rap sheet can attest, but racing is not a cheap hobby to persue. So my entire life has been spent in ignorance of racing. The one aspect of racing that I enjoy is innovation. As an engineer I like seeing problems solved in new ways. Unfortunately most racing rulebooks are thick enough that real innovation is a rare event. When it does occur it only garners a few wins before inspiring a new chapter in the rulebook. 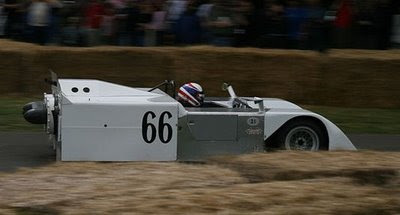 One car that I had read about is the Chapparral 2J. It used 2 fans with a snowmobile engine to vacuum the car to the track. This was a decided advantage on slow turns where aerodynamic downforce couldn't be generated. While it didn't win any races due to mechanical problems during it's single 1970 season, it did inspire some new rules. Someone else was inspired by the 2J. Last year's winner of Grassroot Motorsport's 2007 Challenge was team Cheaparral. The 2007 Challenge is a low-buck performance competition in which entrants struggle to build and race a car for under $2007. The challenge has several events and the Cheaparral team's 1986 'vette swept them all. How? They spent 1000's of manhours and had a key piece of technology: a cooling fan from an M1 Abrams. A junked snowmobile motor and a plywood skirt later and they had their own J2 clone.